Bristol launched a spirited fightback to earn an unlikely win at London Irish and go top of the Premiership. The hosts dominated the first half and led 11-3 at the break through a Kieran Roche try and two penalties from New Zealand fly-half Riki Flutey. Jason Strange kicked the visitors back into contention with two penalties soon after the break. 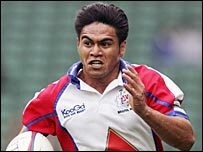 Two defensive mistakes from the hosts then gifted David Lemi and Lee Robinson converted tries to see Bristol home. London Irish started much the better and put Bristol's usually reliable line-out under big pressure. However, the visitors defended manfully and the hosts could only manage two Flutey penalties and the try from Roche. It was a cracker, as Ojo screamed down the right touchline before the Exiles switched play to the left and Catt's long pass enabled Magne to put Roche over unopposed. Bristol's only points came from a Strange penalty and they lost Joe El Abd with what appeared to be a dislocated ankle and David Hilton to the sin-bin. At the start of the second half the game swung towards Bristol as Strange landed two penalties and London Irish lost Danie Coetzee to the bin just after Hilton returned. Just before the hour mark Delon Armitage's poor chip enabled Lemi to scoot over in the corner and Strange's conversion made it 16-11. Bristol made sure of the points when the hosts failed to control the ball at a ruck and Robinson was sent over in the corner, although there was a suspicion of a forward pass. Strange converted as Bristol headed home down the M4 savouring a three-point lead at the top of the table. The game was notable for the record-equalling appearance of London Irish prop Neal Hatley, who came on in the second half to make his 174th Premiership appearance. "Our first half was very good. We should have had a bigger lead and we found it very frustrating early in the second half when they slowed the game down. "Once they took the lead we didn't regain enough composure and we didn't think clearly enough under pressure. "We lost our composure and it's a shame we made a couple of poor decisions on when to play field position." "At 11-3 down we were hanging on. "We had a man in the sin-bin and Irish were showing real pace in attack. "Why we weren't 20 points down I don't know. We weren't controlling our own ball, we were very frenetic and not playing how we had planned. "At half-time we said, 'Just keep the composure, keep the ball closer and do not allow them to put pressure on us.'" London Irish: D Armitage; Ojo, Feaunati, Catt, Bishop; Flutey, Hodgson; Lea'aetoa, Coetzee, Skuse; Kennedy, J Hudson; Roche, Magne, Leguizamon. Replacements: Hatley, Russell, Fitter, McCullen, Murphy, Geraghty, Everitt. Bristol: Taumalolo; Robinson, Higgitt, Cox, C Morgan; Strange, Perry; Hilton, Regan, Crompton; Winters, Llewellyn; Salter, El Abd, Ward-Smith. Replacements: Clarke, Blaney, Budgett, To'oala, O'Riordan, Gray, Lemi.